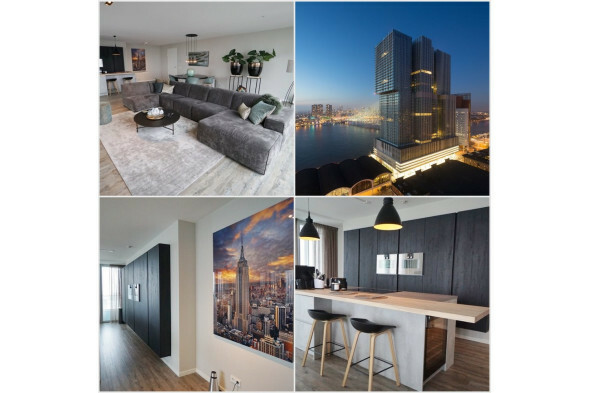 Experience a panoramic view of the Erasmus Bridge, the river Maas and the bustling city center of Rotterdam from the 43rd floor of the iconic building 'De Rotterdam. This luxuriously finished apartment is completely furnished and equipped with a glass facade from top to bottom, giving you a magnificent view of the city facing south. 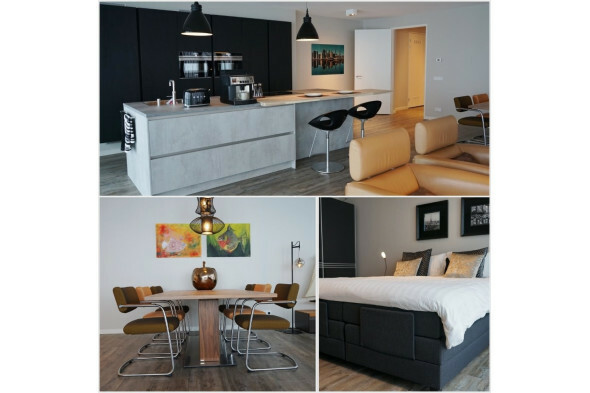 This beautiful apartment allows you to fully enjoy Rotterdam! Ground floor: Entrance with conciërge, mailboxes and access to the parking garage on the ground floor. Entrance to the apartment on the 43rd floor. Entrance hallway with access to a built-in cupboard and electricity closet. Toilet with hand basin. Spacious internal storage room with washing machine and dryer. Bright living room with open kitchen and great view over the city. The open kitchen is equipped with a combi microwave / oven, induction stove with extractor fan, fridge with freezer stock and dishwasher. The spacious bedroom has a new box spring bed and a two closets. In addition, the bathroom can be reached through the bedroom which is equipped with a bathtub, separate walk-in shower and a double washbasin with large mirror. In 44 / floors you have access to a full-time service manager who arranges all kinds of practical matters for you. He is at your service and ensures that everything within the building runs smoothly. Extra services include dry cleaning, ironing, a maid if needed and a cobbler. On the 25th floor there are two guest rooms where you can accommodate your guests. In the area of ​​security, 24/7 camera surveillance is provided in the lobby. When it comes to the many services or residential matters, you can also arrange this day and night via the website 44 / floors services that is only accessible to residents.